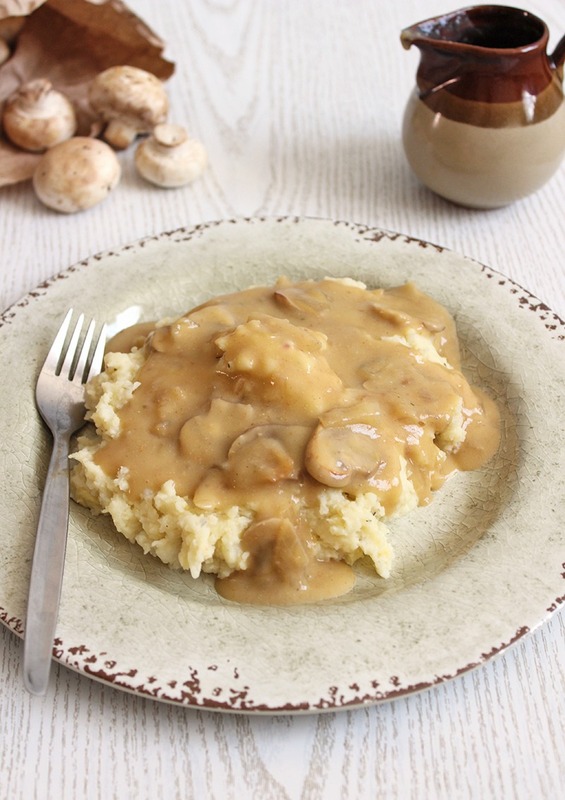 For the longest time I’ve thought of gravy as only a companion to meals with meat. Growing up, my family would make gravy from the oils left in the bottom of a roast pan – this is likely where my limited thoughts of it came from. 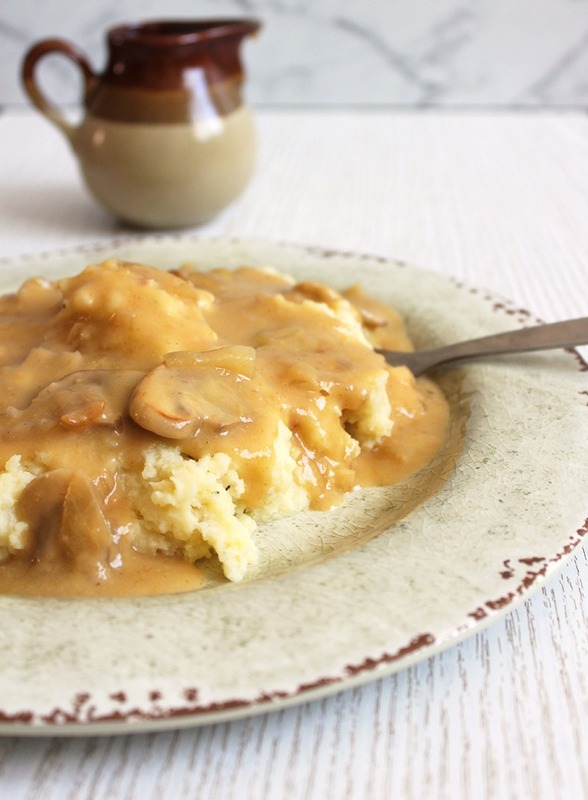 It was only very recently when I was thinking of something quick and easy to whip up that would spruce up a plate of veggies, that I thought of a thick ‘n’ creamy gravy. I know it’s not a common revelation, but for me it was. 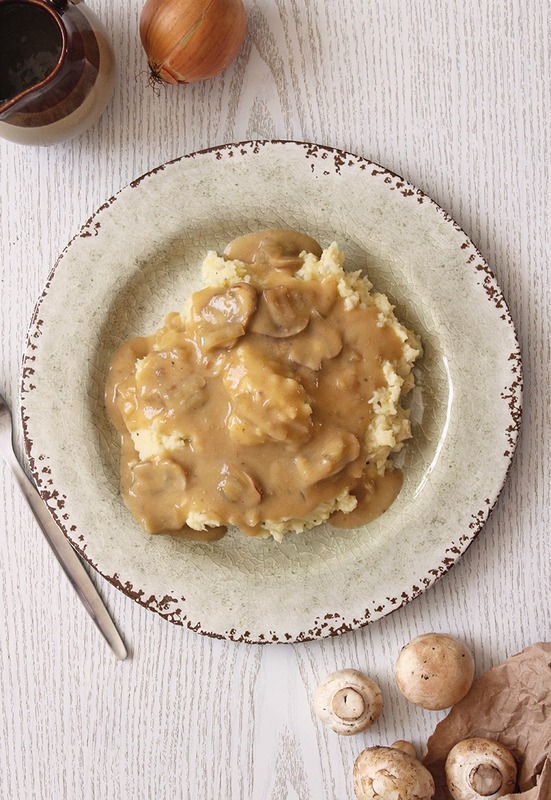 This gravy is made using fried onion and mushroom for texture and flavour, plain and arrowroot flours to thicken, and vegan butter to add fat and lots of creaminess. Overall it uses 7 ingredients and takes about 20 minutes to make. It’s a wonderful and subtle side dish to share with others and would be perfect for holiday get-togethers. I know I’ll be bringing it along to mine. This recipe ended up adding a newness to meals and side dishes like mashed potato, steamed veggies, etc. that is so simple yet so enjoyable for me. In case you hadn’t noticed yet, I’m very much about appreciating the little things in life, they bring me a lot of joy and this happened to be one of those things. If you make this dish, I hope you love it as much as I do! Finely dice 1 onion and thinly slice 3 button mushrooms. Fry them in a pot over a medium heat until they’re soft and lightly brown, then set aside. In the same pot over a low heat, melt the vegan butter and then slowly whisk in the flour. Add the water, vegetable stock powder and arrowroot flour. Whisk until completely smooth then let it simmer softly for about 5 minutes until it becomes thick and creamy. Add your fried onion and mushrooms back in, flavour with salt and pepper to taste and serve over potatoes, veggies or a vegan roast. Enjoy! 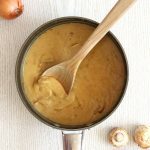 If you made this gravy, share it with me on Instagram @lemonthy.me! If you have any questions, comments or suggestions, please comment them below!